This post was originally published on June 18, 2010. 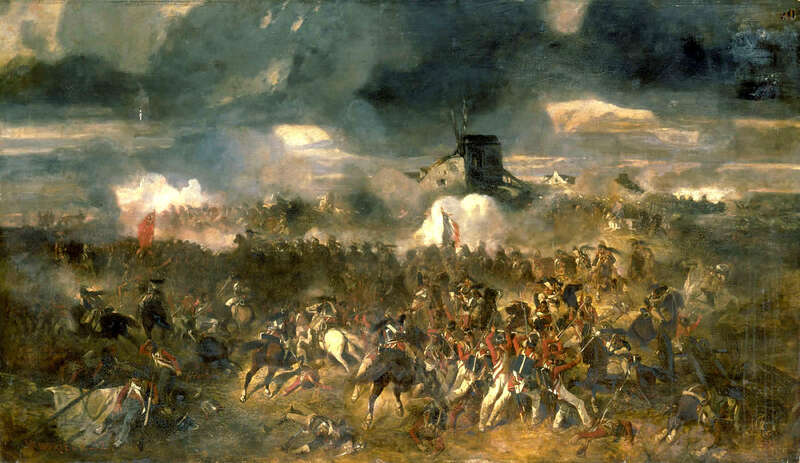 When one thinks of the great British soldiers at the Battle of Waterloo, one naturally conjures up visions of the Duke of Wellington, Alexander Gordon and, of course, the Marquess of Anglesey, but one rarely thinks of Sir Frederick Cavendish Ponsonby, whose Waterloo experience is, in my opinion, one of the most remarkable. Aftds. Maj.-Gen. Sir Frederick Cavendish Ponsonby, K.C.B. and K.M.T., Gov. of Malta. 2nd son of Frederick, 3rd Earl of Bessborough, by Lady Henrietta, 2nd dau. of 1st Earl Spencer. Bn. 6th July, 1783. Cornet 10th Lt. Dgns. 1800. Maj. 23rd Lt. Dgns. 1807. At head of this regt. distinguished himself at Talavera, in 1809. Lt.-col. of the regt. 1810. At Barossa, with a squadron of German dragoons, he charged the French cavalry covering the retreat, overthrew them, and took two guns. Lt.-Col. 12th Lt. Dgns. 1811. Again signally distinguished himself at the battles of Salamanca and Vittoria. From this, one would have nary a clue of the truly death-defying experience of this officer, a favorite of the Duke of Wellington’s. Ponsonby was the the second son of the 3rd Earl of Bessborough and Henrietta (Harriet) Spencer, whose sister was Georgiana, Duchess of Devonshire. 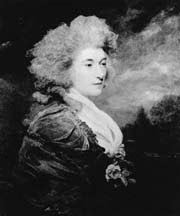 Sir Frederick’s own sister was the notorious Lady Caroline Lamb. Talk about your Regency soap opera – Lady Bessborough had had a brief affair with Richard Brinsley Sheridan and another with Lord Granville Leveson Gower, with whom she had two children before marrying him off to her niece, Lady Harriet Cavendish. But I digress . . . . . . In 1815, Frederick was 33 years of age when he was called to accompany Lord Castlereagh (above) to the Congress of Vienna, which sat after Napoleon’s first abdication to restore the balance of power in Europe and to divide the spoils. The Congress was showing signs of violent disagreement, when to the horror and amazement of Europe, Napoleon escaped from Elba and landed at Cannes. 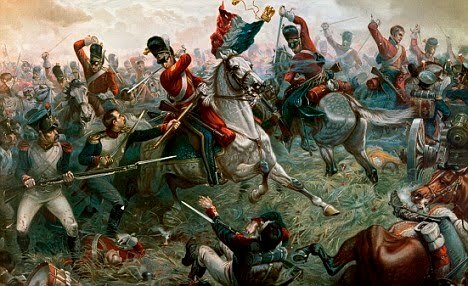 The French Army rallied to him regiment by regiment as he marched through France toward the capital. He entered Paris on March 20, while the King and his family fled. Those English familites who had gone to Brussels to economize after the war knew that they were in a terrible position when Napoleon, who by then commanded an army of 535,000 men, marched to join it on the Belgian frontier on June 12. At Waterloo, Sir Frederick was attached to the 12th Light Dragoons, who were ordered, along with the 16th Light Dragoons, to charge down a slope to support the withdrawal of the Union Brigade of heavy cavalry, which was being led by his second cousin, William Ponsonby, who lost his life that day. It would have been all too easy for Sir Frederick to have met his own death, as well. In fact, he would presently, and within a very short span of time, be presented with several ways in which he could have lost his life. You have often wished for some written account of the adventures and sufferings of your son, Colonel Ponsonby, on the field of Waterloo; the modesty of his nature is however no small obstacle in the way. Will the following imperfect sketch supply its place until it comes? The battle of the 18th of June was one morning alluded to in the library at Althorpe, and his answers to many of the questions which were put to him are here thrown together, as nearly as I can remember in his own words. 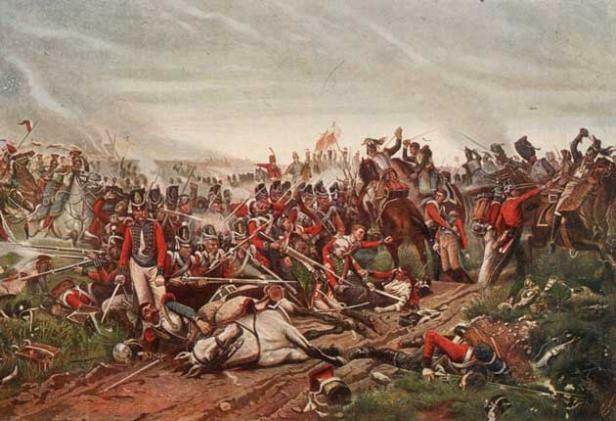 “The weather cleared up at noon, and the sun shone out a little just as the battle began. The armies were within 800 yards of each other; the videttes, before they were withdrawn, being so near as to be able to converse. At one moment I imagined I saw Bonaparte; a considerable staff was moving rapidly along the front of our line. I was stationed with my regiment, about 300 strong, at the extreme of the left wing, and directed to act discretionally; each of the armies was drawn up on a gentle declivity, a small valley lying between them. “Whilst the battle continued in that part, several of the wounded men and dead bodies near me were hit with the balls, which came very thick in that place. Towards evening, when the Prussians came up, the continued roar of cannon along their and the British line, growing louder and louder as they drew near, was the finest thing I ever heard. It was dusk when the two squadrons of Prussian cavalry, both of them two deep, passed over me in a full trot, lifting me from the ground, and tumbling me about cruelly—the clatter of their approach and the apprehensions it excited may be easily conceived. Had a gun come that way, it would have done for me. The battle was then nearly over, or removed to a distance. The cries and groans of the wounded all around me became every instant more and more audible, succeeding to the shouts, imprecations, and cries of ” Vive l’Empereur,” the discharges of musketry and cannon, now and then intervals of perfect quiet which were worse than the noise. I thought the night would never end. Much about this time one of the Royals lay across my legs—he had probably crawled thither in his agony—his weight, convulsive motions, his noises, and the air issuing through a wound in his side, distressed me greatly—the latter circumstance most of all, as the case was my own. “It was not a dark night, and the Prussians were wandering about to plunder, and the scene in “Ferdinand Count Fathom” came into my mind, though no women, I believe, were there. Several Prussians came, looked at me, and passed on. At length one stopped to examine me. I told him as well as I could, for I could speak but little German, that I was a British officer, and had been plundered already. He did not desist, however, and pulled me about roughly before he left me. About an hour before midnight I saw a soldier in an English uniform coming towards me. He was, I suspect, on the same errand, but he came and looked in my face. I spoke instantly, telling him who I was, and assuring him of a reward if he would remain by me. He said that he belonged to the 40th Regiment, but that he had missed it. He released me from the dying man, and being unarmed, he took up a sword from the ground, and stood over me, pacing backwards and forwards. “‘At 8 o’clock in the morning some English were seen at a distance. He ran to them, and a messenger was sent off to Colonel Harvey. A cart came for me—I was placed on it, and carried to a farmhouse, about a mile and a half distant, and laid in the bed from which poor Gordon, as I understood afterwards, had been just carried out. The jolting of the carriage and the difficulty of breathing were very painful. I had received seven wounds; a surgeon slept in my room, and I was saved by continual bleeding—120 ounces in two days, besides a great loss of blood on the field. As it happened, Lord and Lady Bessborough had been on a Continental tour in the months prior to Waterloo and were coming slowly home when the news reached them on July 8 that their son had been desperately wounded at the Battle of Waterloo. Lady Bessborough (at right) made a forced journey to Brussels to nurse him, and Lady Caroline Lamb joined her there. 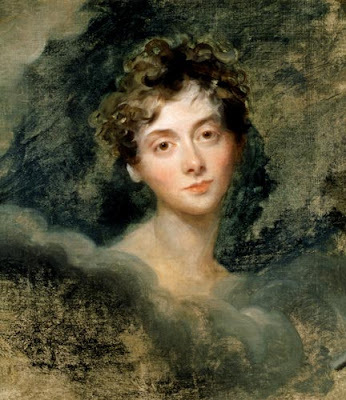 To her credit, Lady Bessborough nursed her son as he recuperated, but Lady Shelley’s letter quoted above indicates that mother and son had not the opportunity, or the inclination, to then discuss Posonby’s harrowing experience. If Creevey’s tour of the ground so soon after the battle seems goulish, here’s a letter written by the recuperating Sir Frederick’s own sister, Lady Caroline Lamb (above), to the Viscountess Melbourne from Brussels, 1815. It is a pouty letter which brilliantly displays Caroline’s petulance and immaturity in the face of so much heartbreak. My Dear Lady Shelley, I write to tell you that there is some prospect that the King will go out of town on Saturday, and in that case we might be able to go to you on Saturday evening, and stay till Tuesday or Wednesday. I will let you know positively to-morrow. Shall I bring down Frederick Ponsonby, who was going with me to S. Saye? Ever yours affectionately, W.
Sir Frederick married Lady Emily Charlotte Bathurst, daughter of Henry Bathurst, 3rd Earl Bathurst of Bathurst and Lady Georgina Lennox, on 16 March 1825. On 27 May 1825, he was promoted major-general, commanding the troops in the Ionian Islands and on 22 December 1826, he was appointed Governor of Malta, holding that post for eight and a half years. 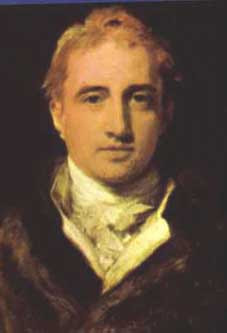 Sir Frederick died on 11 January 1837 at the age of fifty-three. * This French officer was Major de Laussat of the Imperial Guard Dragoons, as Sir Frederick would learn in 1827 when the two met socially and soon after, through a conversation regarding the experiences of each during the Battle, discovered the coincidence of their first meeting upon the field.